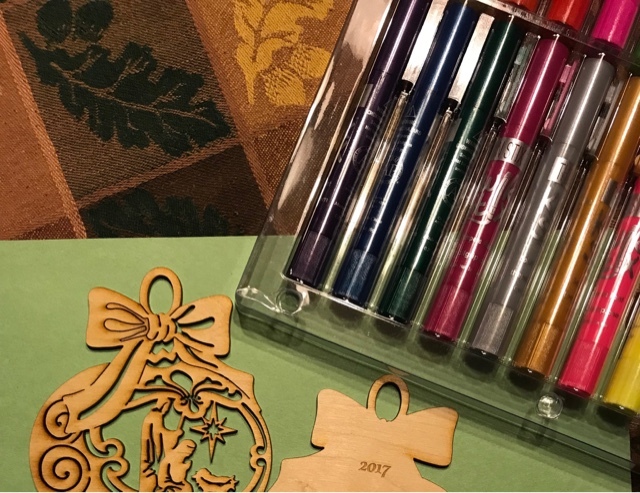 The following is a review of Thin Stix Creativity Pack from The Pencil Grip, Inc. with the TOS Homeschool Review Crew. Earlier this year we shared how perfectly the 6-pack of Thin Stix Classic Colors worked so well to boldly paint rocks for a Mother's Day gift. 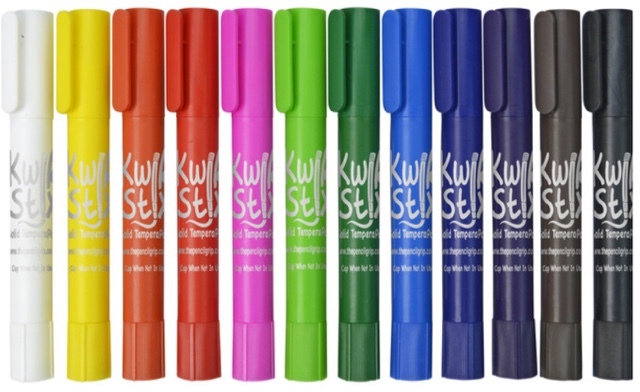 This time, we were thrilled with the opportunity to try out the complete spectrum of colors offered in their Kwik Stix THIN Stix Creativity pack with all 24 colors of their non-toxic tempera paint sticks! 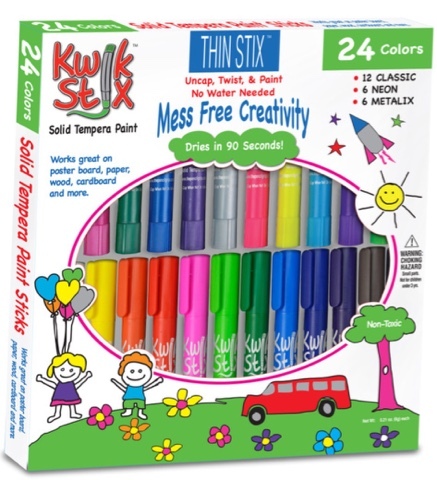 "Kwik Stix are not only egg, peanut, and gluten free, but they are also dairy and soy free." I've been looking forward to trying their metallics. What color would you try first? And their original 12 bold and bright colors! I don't want to paint with anything else any more. Mess free paints must have been made with me in mind! 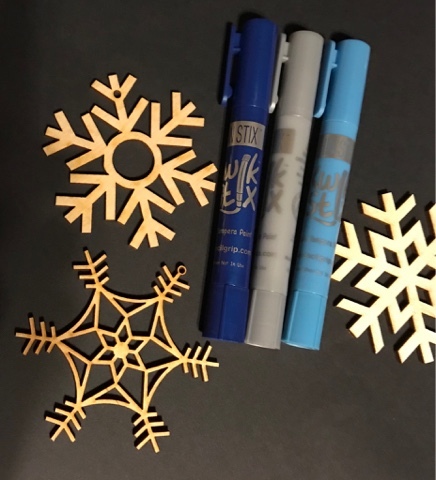 We decided to use these Thin Stix to paint some of our wooden ornaments. We designed some two layer ones that allow color on the front of the back layer to show through the holes cut in the front layer. I love that effect! We contemplated all of our color choices and decided that a dark color would give the most contrast, then we narrowed our options down to purple or blue. Almost as soon as we finished, it was dry enough to glue the two layers together. Layers of color make the paint look darker and it becomes more thoroughly covered. 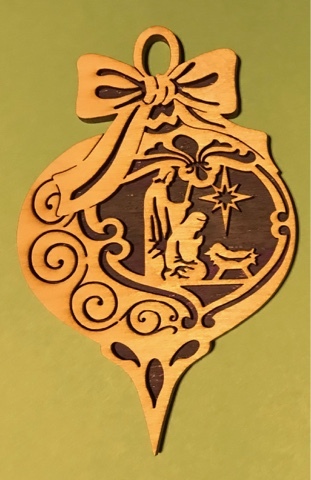 Although we didn't try layering multiple different colors for these wooden ornaments, we did try that on paper before and it gives it a nice appearance. I may try mixing some of the different shades of the same color on the next ones we paint. 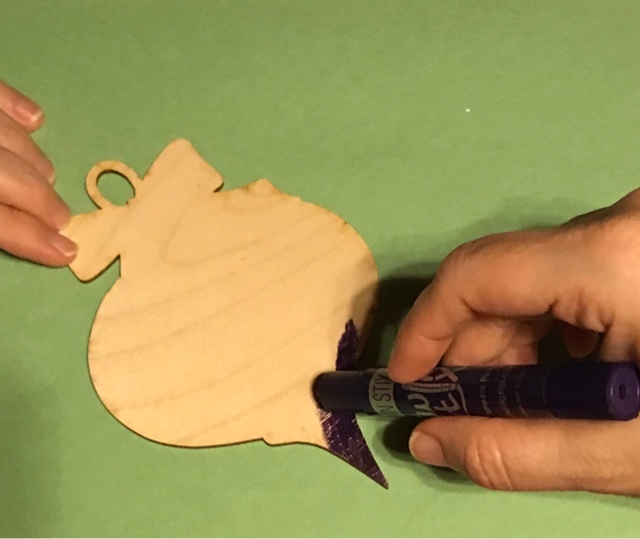 My daughter decided that coloring with the wood grain instead of against it looked better as it covered the surface more smoothly. 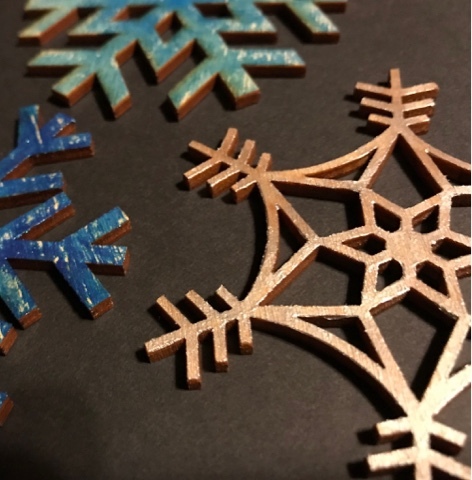 The silver metallic Thin Stix paint really popped on this snowflake. My daughter colored with the wood grain and a bit more heavily for solid coverage. They all look beautiful! 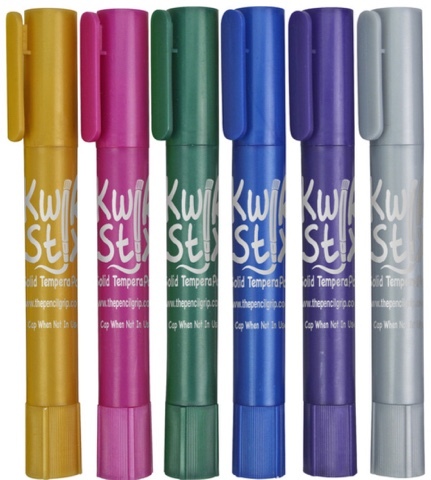 We are planning to paint ornaments with friends before Christmas, and Kwik Stix will be my top recommendation for decorating them. What would you try with a box of Kwik Stix? Scroll back to my previous post and be sure to enter my current giveaway. The featured prize is a box of the original 12 Kwik Stix. 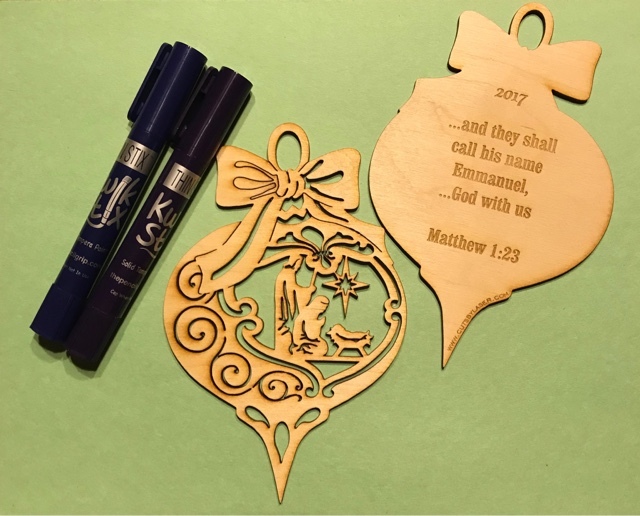 Click the link below to see what others on the TOS Homeschool Review Crew made and painted with Thin Stix. 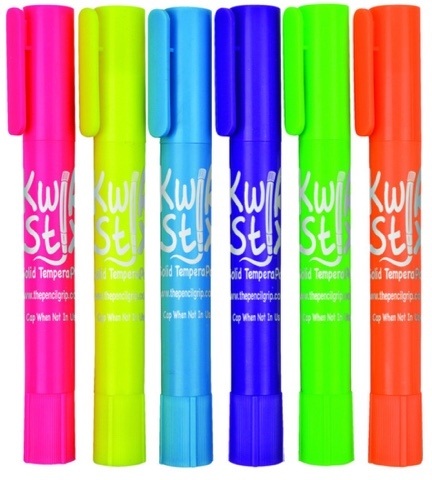 The Pencil Grip, Inc. offers many more unique products in addition to their cool Kwik Stix. Visit their website and see my favorite grip: The Pencil Grip as well as a plethora of adaptive writing and fine motor tools. 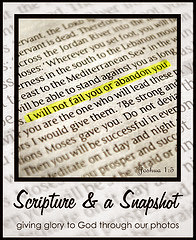 Find them online on Facebook, Twitter, and Pinterest, and be sure to tell them hi from Jennifer at A Glimpse of Our Life.